Dr. Wassim Shahin is the Interim Dean of the Adnan Kassar School of Business, a professor of economics and the President of the Middle East Economics Association. He previously served as assistant provost for special external projects. 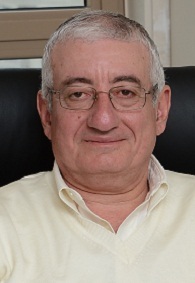 He was also the founding dean of the Adnan Kassar School of Business on Byblos campus from 1996 to 2011. Dr. Shahin is a board member of several banking institutions namely the National Institute for the Guarantee of Deposits, KAFALAT, and is also a consultant for private banks on issues of risk management, regulation, anti-money laundering and counter-financing of terrorism. He is a research fellow in the Economic Research Forum, a current member of the editorial boards of several journals of economics and a previously elected member of the Board of Directors of the Middle-East Economics Association. Many of his writings and research addressed banking and monetary policy with several articles apply to Lebanon and the Middle-East. He is mostly cited for co-authoring academic articles developing mathematical models to combat terrorism and illegal criminal activities and is the founding editor of the academic journal Review of Middle-East Economics and Finance. Before joining the Adnan Kassar School of Business, he held tenured and visiting positions at Indiana University, where he earned his doctorate. Shahin, W. & El-Achkar, E. (2017). Banking and Monetary Policies in a Changing Financial Environment. UK: Routledge. Peeters, M. & Sabri, N. & Shahin, W. (Eds). (2013). Financial Integration: A Focus on the Mediterranean, Heidelberg, Berlin: Springer. Shahin. W. & Al-Achkar (2012).”The Impact of Monetary Policy and Financial Sector Development on Economic Growth in GCC Countries” in by Woertz, E. (ed.) GCC Financial Markets: The World’s New Money Centers, Gerlach Press. Shahin, W. (2011). “Channels and Environments of Monetary Policy and their Implications for its Conduct in GCC Countries”, in Cobham, D. & Dibeh, G. (Eds.) Money in the Middle East and North Africa: Monetary Policy Frameworks and Strategies in MENA. Routledge Political Economy of the Middle East and North Africa. Shahin, W. & El-Achkar (2009). Exchange Rate Arrangements and Price Stability in MENA Countries”(with Elias El-Achkar), in Cobham, D. & Dibeh, G. (Eds.) Money in the Middle East and North Africa: Monetary Policy Frameworks and Strategies in MENA, Routledge Political Economy of the Middle East and North Africa. Freiha, F. & Shahin, W. (2005). Hysteresis in Currency Substitution: The Middle East and North Africa, in Neaime, S. & Colton N. (Eds. ), Money and Finance in the Middle East: Missed Opportunities or Future Prospects? Elsevier Publishers, 2005. Shahin, W. & Shehadeh, K. (1997). Pathways to Integration: Lebanon and the Euro-Mediterranean Partnership. Lebanon: Lebanese Center for Policy Studies and The Konrad Adenauer Foundation. Shahin, W. (2019). “Aftermath: Regulatory Wrangling in the Financial Sector Following the Great Recession” (with Muhammad Islam, James Gilsinan and James Fisher), The Company Lawyer. Shahin, W. (2013). Compliance with International Regulation on AML/CFT: The Case of Banks in Lebanon. Journal of Money Laundering Control, 16(2), 109-118. Shahin, W. (2007). Basel II and Securitizing Bank Holdings of Foreign Currency Government Debt. Journal of Banking Regulation, 8(2), 853-645. English, M. & Shahin, W. (1994). Investigating the Interest Rate Impact of Changing Secret Bank Deposit Laws: Switzerland. Journal of Banking and Finance, 18(2). Shahin, W. & Islam, M.(1992). Combating Political Hostage-Taking: An Alternative Approach. Defense Economics, 3(4). Shahin, W. & Islam, M. (1990). The Contribution of Economic Methodology to our Understanding of Terrorism. Journal of Interdisciplinary Economics, 3(3), 197-207. Shahin, W. (1990). Unorganized Loan Markets and Monetary Policy Instruments. World Development, 18(2), 325-332. Shahin, W. (1989). Money Supply Implications of Financing Deficits Through Captive Buyers in a Dual Loan System. Quarterly Review of Economics and Business, 29(2), 87-95. Islam, M. & Shahin, W. (1989). Economic Methodology Applied to Political Hostage-Taking in Light of the Iran-Contra Affair. Southern Economic Journal, 55(4).